Life has been quite a whirlwind lately. I’ve been working a lot both at my corporate job and also teaching dispatch. I wish I could have taught more this time around, but I tried out my PowerPoint on flight planning and I think it went over pretty well. I’ve made a few adjustments to it and next time should be even smoother. Got to go up in the Cub again and work on crosswind landings this time. It’s amazing how much left aileron was in, maybe I just felt it more using a stick instead of a yoke. I’m getting the hang of the 3 point landings, hoping to work on some wheel landings soon. Next lesson, we’re going to pavement! Who knew that would excite me? I’m still loving being on a grass field though. Make me feel kind of like a bush pilot. I had to cancel my lesson last week due to the cold, and it’s looking that might happen again on Friday. The Cub doesn’t have great heat (it turns cold air into cool air) and even the last time I was pretty cold, I’m sure I’d end up a popsicle by the end of the lesson. Other exciting news, I received a Women in Aviation scholarship! I’m very honored and excited to have won it! It ended up being more than expected and it’ll definitely help working my way towards my commercial rating! What I love most about winning a scholarship is connecting with other winners and creating a bond that each person helps the other achieve their goals and pushes them to be better. I found that through my last scholarship with Girls with Wings and can’t wait to meet more Women in Aviation scholarship winners, we had two others in my chapter this year. I hope to bring you news from the WAI conference in Dallas next week! After my aerobatics lesson, my CFI and I decided first to focus on my tailwheel endorsement and put a pin in aerobatics for a few lessons. Originally, my lesson was scheduled for Wednesday. Due to slowly deflating tire and slow mechanics, I had to cancel. I rescheduled for Friday and the weather stuck it out for me! I’m getting my tailwheel endorsement in the Piper Cub. It’s such a fun plane! 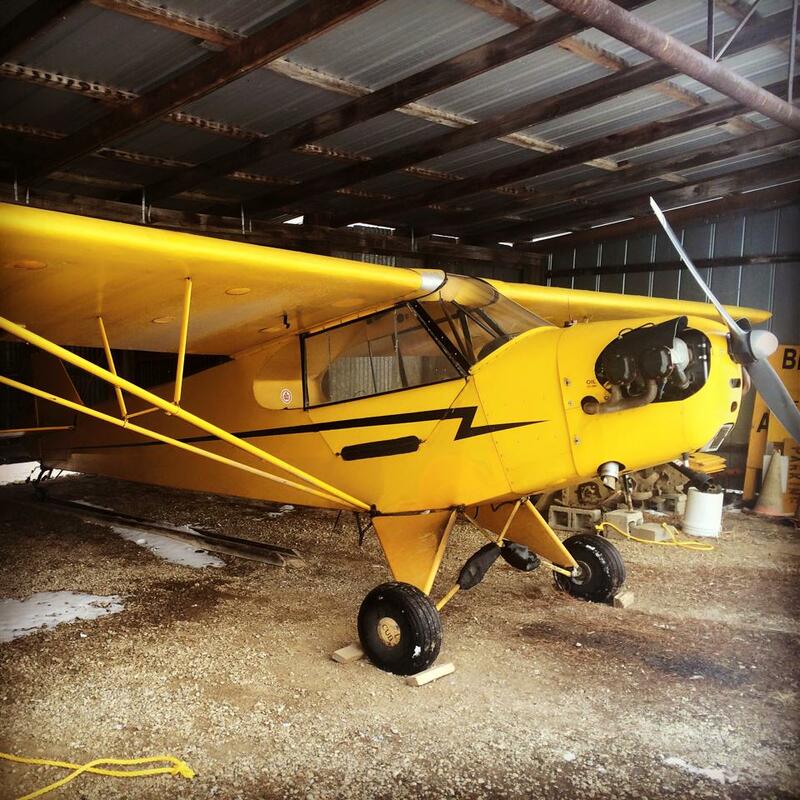 Tailwheel, no flaps, very basic. Unlike the Citabria, the PIC sits in the back. It’s due to when you fly solo it’s the only way to make the CG correct. When there’s another person in there with you, especially with a thick winter coat, it’s very difficult to see the instruments. This was my first experience hand propping a plane! It was not as difficult as I thought. I was at the controls, which freaked me out just a bit since all the FAA literature really focuses on having a skilled pilot behind the controls. I didn’t kill my instructor, so that’s a good start! He did the first take off, and we went out a bit to do some stalls. The Cub stalls similar to the 152. It’s hard to stall. The Cub’s elevator pressure gets really heavy before the stall as a way to prevent stalls. When I was learning in the 152 it took some time to stall it. It’d be close to the stall and I’d start to lose coordination. I would know it, and it was probably part of the reason I was so scared of spins because the wing would drop. The Cub is similar and we purposely dropped a wing on the last stall. It was a bit more harsh than the 152, but no big deal. We headed back to the field to do landings. Since it’s a grass field, we had to land, taxi back, and take off. Of course, my first few landings were quite bad and bouncy. I was too fast (no flaps), rusty from not working on my landings for 7 months, and it’s a frozen grass field. Mainly, I was too fast though. I got pretty good at soft field take offs. There’s no option for anything else. What’s nice is that the Cub really just wants to do that it seems. After you push the stick forward to build speed right above the ground, it almost seemed to want to just release some pressure and start climbing. Back to the fact I couldn’t really see the instruments, it made me really focus on my visual flying and the sounds of the aircraft. The climb out was based on how it looked and sounded, I would check my airspeed every so often when I could crane my head around. I did have to look at the altimeter to make sure I stopped at pattern altitude. The last time I really looked at the instruments is pulling the power back to 14000rpm and then it was all sight and sound. Another thing during my primary training I wasn’t completely comfortable with was slips into landing. In a 152, you have flaps. You don’t have that choice in the Cub, so you pretty much have to slip if you want to land. Slips are now no big deal! The other important thing, since it was so cold out, you have to watch your throttle after landing. There were a few times that we landed and the Cub almost stopped on the runway since it was on idle for too long and was cold. So now I’m in the habit of landing, slowing down and pushing some throttle back in to save the engine from quitting. We were doing 3 point landings for the lesson. I flared in the landing versus trying to keep the tailwheel up. They were getting better by the end, but still a bit to go before I’m comfortable in a tailwheel. Can’t wait for next week! I hope it’s warmer though because by the end I was pretty frozen.